Samsung Galaxy S9+ vs Galaxy Note 8: which is supreme? The Galaxy Note 8 made us forget the sad story of the Galaxy Note 7 and put Samsung's reputation for making phablets back on its pedestal. Now the Korean company is currently offering two phablets which, at first glance, appear to be in competition with each other. What is the difference between Galaxy S9+ and Galaxy Note 8? Samsung took advantage of MWC 2018 to present the Galaxy S9 and S9+. Within three weeks, the first pre-orders should be arriving. The Galaxy Note 8 has already been available in shops for a long time. 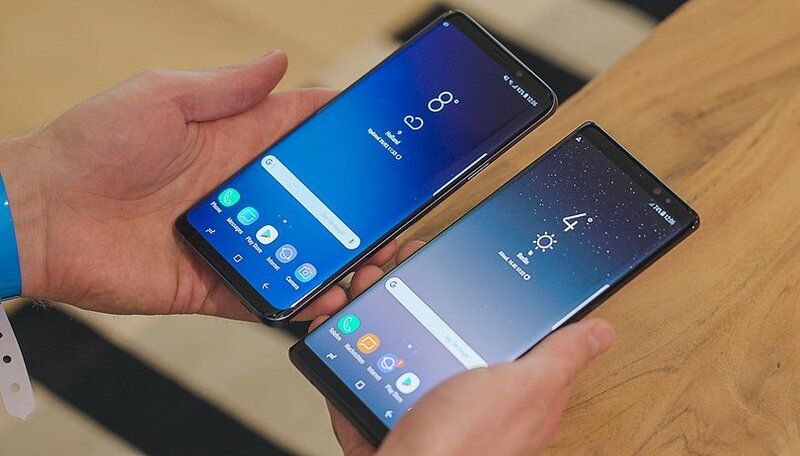 Visually, the two smartphones are very nice, and it should be pointed out that Samsung has not changed much in terms of design: they both have curved glass at the front and rear and an aluminum chassis. The finish is simply excellent. However, the Galaxy Note 8 has slightly more pronounced corners and the gap between glass and metal is more noticeable to the touch. The S9+ is a little more well integrated overall. It is also important to note that the Galaxy S9+ is a little smaller, lighter, rounder and generally easier to handle than the Galaxy Note 8. For example, the position of the fingerprint reader is much more accessible on this new model. The Galaxy S9 Plus is Samsung's second smartphone to feature a dual camera (the first being Note 8). The second lens of Note 8, a telephoto lens to be precise, is also present on the S9+, as is the camera of the S9 with its variant aperture (between f/1.5 and f/2.4) and its new sensor. We will need to do a full test to see the real differences between the two models. By looking at the technical specifications, we can see that the differences between the two devices are not huge. The screen size of the Note is larger than that of the S9+ but the definition and format are identical. On the level of RAM, both devices are tied but as far as the internal memory is concerned, the Galaxy Note 8 does not have the possibility of having 256 GB. It is interesting to note that in the Galaxy S9+, which is actually smaller than the Note, there is a 200 mAh battery that is larger than Note 8. For many fans of the Note 8, the best feature of the phone is the S-Pen. Every year, this pen gains new functionalities and distinguishes itself from the competition. On this point, the Galaxy S9+ does not offer an equivalent. If you want to use an S-Pen, you have only one choice: the Note 8. So should you jump from the Note to the Plus? Overall, the conclusion is the same as our comparison between the S9 and S8: if you own the old model, there is no real reason to choose the new one. The speed and camera advantages don't really make any difference, only the largest battery and better ergonomics play in favor of the S9 Plus, and that's a lot of money for a bit of battery life and comfort, especially if you'll miss the S-Pen. Which is Samsung's best phablet? Are you thinking of getting the new Galaxy S9+? Or waiting for news about the next Note phablet? The S9+ bills itself as "The camera reimagined". So that is supposed to be this device's main selling point and one of the reasons a Note8 owner might be considering in making the switch. However, the much touted "variable" aperture only gives you the option of the 1.5 or 2.4 with no Fstop options in between which can result in overexposed shots in daylight or artificially looking lighted shots in dimly lit scenes because the sensor remains small. Phone Arena did a good article comparing the S9+ vs the Note8 and other contenders in low light conditions and the Note8 did as well if not better than the 9S+ in a number of the scenerios. I use my cameras a lot and good shots are important to me but in my honest opinion I don't see where the 9S+ is worth shelling out another grand especially when you have the ported Pixel cam as another option for your Note. So don't buy it? They're not a charity and you deserve nothing for free. There are all kinds of cheaper options.